The term "creativity" in marketing organizations conjures up a different image for everyone. Some people associate it with brainstorming sessions, others with staff retreats involving crafts or games. Still others think about "creativity" in relation to the collection and presentation of data. But according to highly creative speaker, consultant, and author Dave Birss, "creativity" is something else entirely. In his new book, How to Get to Great Ideas: A System for Smart, Extraordinary Thinking, Dave begins by debunking 10 myths about creativity. "One of those main myths is that creativity is binary, so you're either creative or you're not, or an idea is either creative or it isn't," he says. "But of course it's not binary: it's a sliding scale," Dave explains. "You measure [creativity] with obviousness. Something that is completely obvious has required no mental effort at all. Therefore, it's not creative." In Dave's view, "something that is nonobvious and gives us value is something we define as being creative." Here are just a few more highlights from our conversation. To build motivation, you just need a little taste of success, and you'll find it suits you (15:50): "A lot of people believe you can't teach curiosity, and I agree. I don't think you can teach curiosity. But I believe you can foster curiosity in the workplace. Curiosity is something you can foster in yourself. "A lot of people think, if you get interested in something, they think, 'But other people are already doing it, and they're doing it so much better than me: There's no point getting started, I don't know where to start.' And then they just forget about it. They are not motivated to get started. But that's not the way motivation works. "The way motivation works is you do it and you go through the slog. The first time you do it, do it small. Go through the slog. You get to the end of it and then you're like, 'Well, actually, I'm quite satisfied with what I did.' You get a bit of a buzz from it, and that buzz feeds you for the next time around the cycle, where you do something. "Go through the slog to achieve something at the end—do something slightly bigger. You end up with this circle where, at the end of it, you get the satisfaction of having achieved something which gives you the energy to go round the circle again.... It's all about building your ability to do stuff." Peer pressure and recognition both foster curiosity in the workplace (17:06): "There's two things that are important for fostering curiosity in the workplace. One is that peer pressure is amazingly powerful. So if you create something that's within the business itself that people are going to start sharing information—sharing stuff that they've spotted that's really interesting and maybe saying why they thought it was interesting—if you put that in as part of what's happening in the business, then if everyone else is doing it, people will start to compete with each other. And you'll start to get more and more people looking for interesting stuff, not just feeding their own mind in a curious way, but feeding other people's minds as they do it. Having peer pressure is an incredibly powerful thing to foster within the workplace so that people are going to do it. "The other thing is to reward people. If you want people to do something creative, you don't reward them financially. You reward them with recognition. If you look at creative industries, what really makes people try harder in creative industries is awards shows. That's why you've got the Oscars, you've got the Tony Awards, you've got the Grammys. There's so many advertising industry awards that are out there. "What we find is that when you give people money, it actually prevents them from coming up with the best ideas. Because what happens when you offer somebody money, if it's something that doesn't require any applied brainpower, like just hammering widgets, then if you offer people money, you will be able to get them to do that faster and more effectively. That's all about going from A to B as quick as possible, and money is a really good way of doing that—financial motivation. "However, coming up with a great idea is not about going from A to B as quick as possible. In fact, it's about wandering as widely away from that directly line as you can to find interesting stuff that is beyond the obvious route for me to be. Money takes you from A to B quickly. Recognition encourages people to wander." A truly different idea will probably scare you (and that's a good thing) (28:34): "Humans, all the neural material we have, we think that all the thinking happens at the meatball at the top of our neck, and it doesn't. We are a distributed nervous system, like every other creature that's out there. Our second brain is our somatic nervous system, it's our enteric nervous system. It's our gut. And our gut has more neurons in it than a hamster has in its entire body. "So you've got this 'hamster brain' in your gut. And when you feel butterflies, it's because the thinking in your gut is releasing chemicals that's having an effect on you. It's a natural thing. So when people feel nervous, their gut responds. And your gut is always going to respond, if you think about it from an evolutionary point of view, if it sees a threat or it sees something it's unfamiliar with, because of you wanting an idea that's going to be different...it will start to activate your gut. "Your enteric nervous system will start to release chemicals because there are things in there that—if it's different—there's a certain element of risk. Your gut will know that there might be certain ramifications from this idea. The person might be thinking it might be hard to sell on. There might be some issues that come up along the way. And all these little questions will come up, and because people don't have sufficient information to say yes, they say no. So I've been showing people that that's not the response to have. "The response to have is, 'How can we get to the information that's going to make me say yes? What are those questions that I need answered?' So, not to trust your gut, but to interpret your gut. Because maybe if your gut is activating, it's activating because the idea is right." For more information, visit DaveBirss.com or follow Dave on Twitter: @DaveBirss. 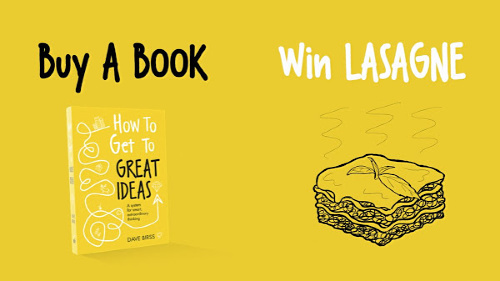 Get your copy of How to Get to Great Ideas: A System for Smart, Extraordinary Thinking. If you do buy a copy, be sure to email Dave a picture of yourself reading it in an interesting location! The Marketing Smarts listener who submits a photo by December 31, 2018, will be eligible to win Dave's special lasagna recipe. 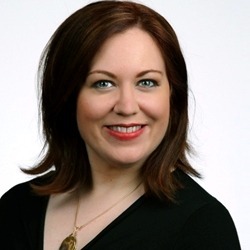 When you email your picture, make sure to mention MarketingProfs, so he'll know you're eligible for the lasagna giveaway. Dave and I covered a lot more ground, so be sure to listen to the entire show, which you can do above, or download the mp3 and listen at your convenience. Of course, you can also subscribe to the Marketing Smarts podcast in iTunes or via RSS and never miss an episode! I first saw Dave Birss present on creativity at Spark.me 2018. You can check out his inspiring presentation on YouTube! Dave Birss, author, speaker, broadcaster, and consultant. Dave is the author of A User Guide to the Creative Mind, and How to Get to Great Ideas: A System for Smart, Extraordinary Thinking. Follow Dave on Twitter @DaveBirss.